Recently I needed to force the inspector to redraw itself from a piece of code outside of a Editor class. The solution I came up with was to call SetDirty on all selected objects of the type I was interested in. The inspector then picked up on the change and refreshed itself immediately. Although this code works under Unity 4 it is a hack and there may be a better way to force the inspector to redraw itself. Did you know your editor scripts can acquire a preview texture for an asset? Check out the members of the AssetPreview class. if you have MonoBehavior code that you want to run while in the unity editor you can use the ExecuteInEditMode attribute and your mono behavior will run as though it was in play mode. The DrawGizmo attribute allows you to setup your gizmo drawing code some place other then with your MonoBehavior class. The code below shows an example of the DrawGizmo attribute used on a method within a Editor class. /// The RenderMapGizmo method will be called if the map is selected. /// Provides a component for tile mapping. … But since gizmo drawing logic is typically for use within the unity editor the DrawGizmo attribute allows you to place the draw logic in a more appropriate location. I have made a few minor changes to my Tile material Creation Window. Provided a download link to the second release of the tool. Added inset field to tweak the selection rectangle by a small amount to help clip off any unwanted pixels bleeding over from adjacent tiles. I have created a tool to assit in creating materials from tiles in a tile set. 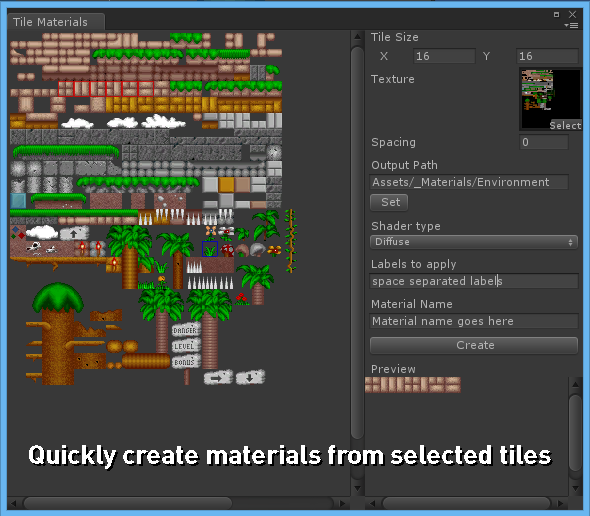 See the Tile Material Creation Window page for *.unitypackage download and more information. If you have private fields that are wrapped with a public property but you want the value of those private fields to be saved with your scene you can use the SerializeField attribute. Did you know you can customize the look of the mouse cursor in your game by calling Cursor.SetCursor? This is not so much a unity specific tip but more of a C# language tip. if you are trying to port or adapt your game code from one platform to another like for example from XNA over to unity implicit operators may come in handy for automatically casting types and making you code much more readable and easier to port. The first code snip is for object billboarding. Just drop the script onto the object and it will automatically face the camera.